The roots of patient rounding can be traced back to a medical center in Birmingham, AL in the late 1980s2. After many years of this concept in practice, studies have shown that it has a direct correlation to improving patient experience. With patient experience scores having an impact on hospital revenue, conducting daily patient rounding is becoming a priority. However, simply completing the round isn’t enough. Patient rounding should be completed with a purpose other than completing the task. The completion rate of rounds won’t matter if the results are not meaningful. So, what is meaningful patient rounding? Nurses have a goal for the number of rounds to complete each day. Their focus is completing the rounds to meet their goal, which is important. However, if your nurses are completing their rounds by rushing in and out of the patient’s room to check the task off their list, you won’t see the full benefits possible from patient rounding. Meaningful rounding is not going through the motions of survey questions. It’s having a real exchange with the patient, engaging them in conversation. When patient rounding is done right, there is compelling evidence to show that it works2. It is important for leaders to communicate the organizational goals and proven benefits to achieve rounding success and exceptional patient experience scores. 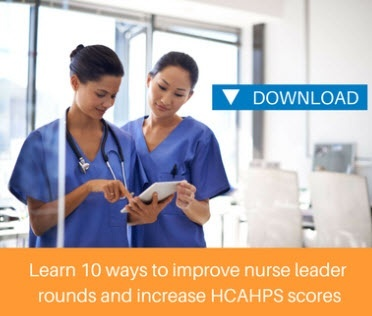 Are your nurse leaders viewing rounding as just another task to complete? Rounding forces our caregivers to make changes in their approach and habits – going outside the comfort zone3. It’s important for their leaders to show them the way to organize their staff differently, with patient rounding as part of the patient experience strategy. Understanding the importance and rationale behind purposeful rounding is key for staff engagement4. The best way to determine your team’s approach to rounding is by shadowing them. Are they making eye contact? Are they having a meaningful conversation with the patient? Is the patient engaged? How do they begin the conversation or engage the patient to get real feedback? Your rounding solution should support your rounding approach. Communication is key for making rounding a success. Using a tool that organizes feedback in an easy to input and easy to view manner will help. Visibility to rounding history, patient preferences, likes and dislikes, as well as notes related to domains will really help drive the conversation. Mr. Jones has low back pain from a motor vehicle accident with his sister. His sister is stable and being cared for in another unit. He had a very long wait time yesterday and was upset about it. He told the nurses to stop calling him Joseph, only his mother used to call him that. The ED has provided you with great information to make a difference is Mr. Jones’ perception of the care your hospital has provided to date. Now it is your turn to make an impacting impression. In seconds, you’ve addressed the primary patient concerns and personalized the conversation. Conversations like this are what will increase the patient perception of care and engage them to give your team valuable feedback to improve your patient experience. Download our eBook: Sustaining Nurse Rounding! Tammy Bourassa leads the business account management team at Clarifire. She came to Clarifire with over 15 years of experience in selling and supporting client software solutions within the healthcare industry. Her industry knowledge ranges from pre hospital/EMS care to inpatient and rehabilitation care. Tammy has successfully led various sales, account management and operational teams. When asked, she said she really enjoys growing business by building relationships. "It's so much fun to work with all the flavors of people and to help solve their issues." Like this article? Feel free to share these tips with a friend or colleague!